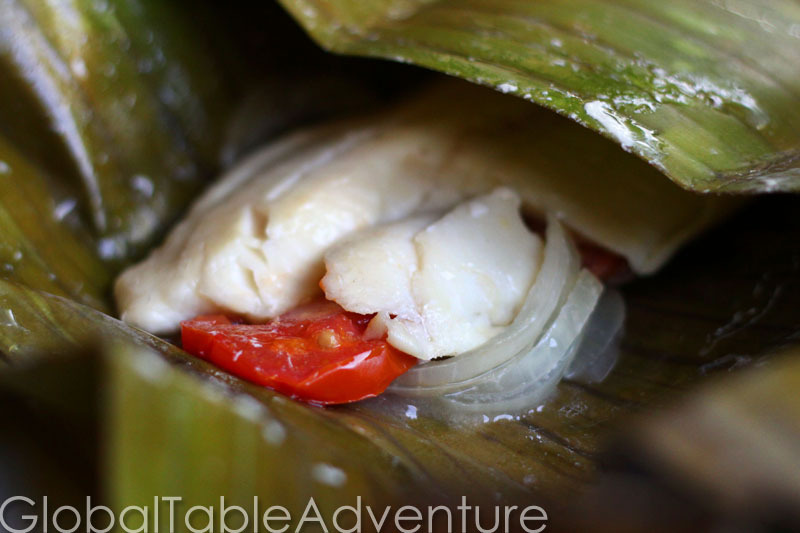 Steaming fish in banana leaves – extremely common in Africa – results in a light, healthy dish. 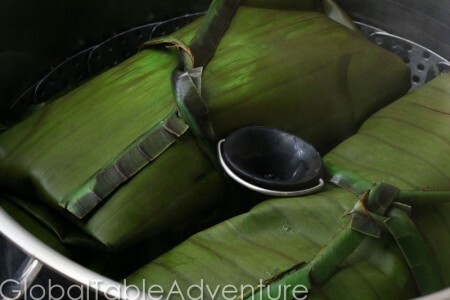 Liboke is a congolese word (in the Lingala dialect) for packets of food cooked in banana leaves. 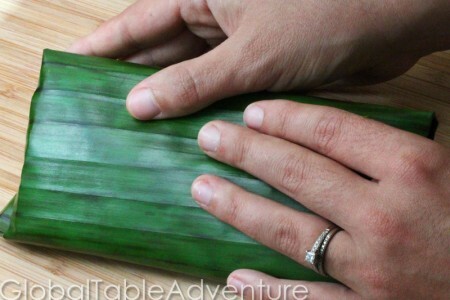 First, prepare the banana leaves. 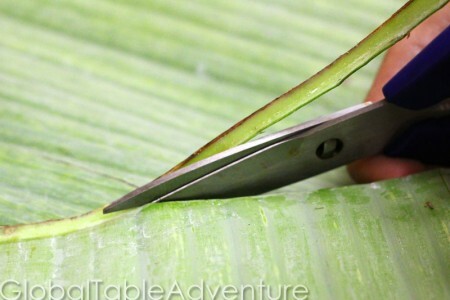 Trim off the tough side of the leaf. 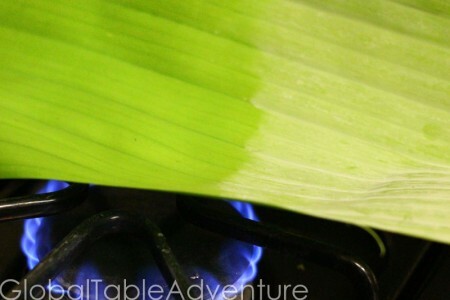 Then run the leaf quickly over a flame to soften it and make it more pliable. When it changes from dull to shiny, it is soft enough. Then, a few tomato slices. Jewl red and just as juicy. 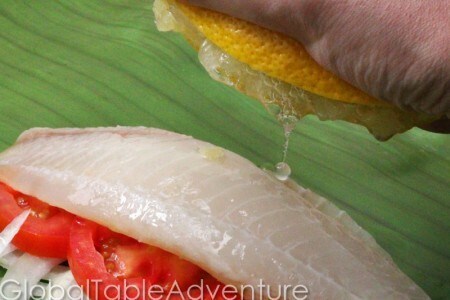 A pristine fillet of fish. 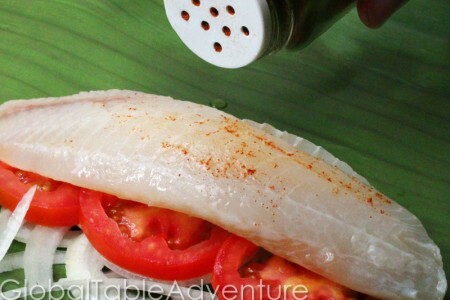 No square, pressed fish here! Sprinkle with a bit of cayenne, if you dare! Or just a bit of lemon juice. Once you have everything in there, fold up the leaf like a burrito. Then, bring the bottom up. Fold the left side to the right. And the right side, fold over, to make a smooth edge. Then fold the left over, to the right. 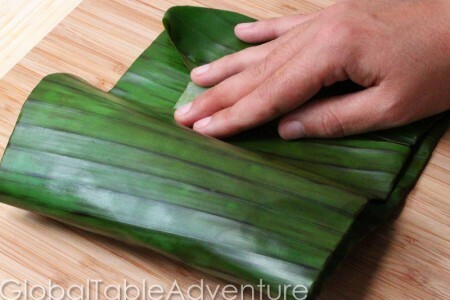 Tie with strips of banana leaf and steam for about 20 minutes. 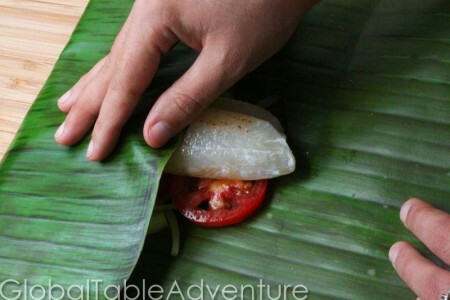 Everything takes on the beautiful flavor of the banana leaves. 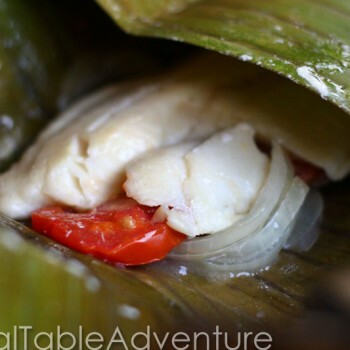 Steaming fish in banana leaves - extremely common in Africa - results in a light, healthy dish. 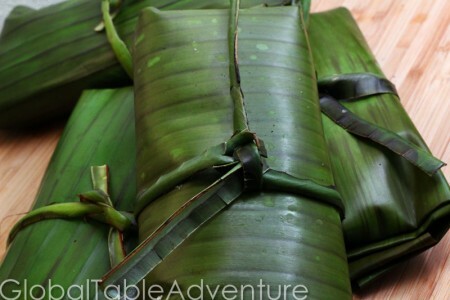 Liboke is a congolese word (in the Lingala dialect) for packets of food cooked in banana leaves. 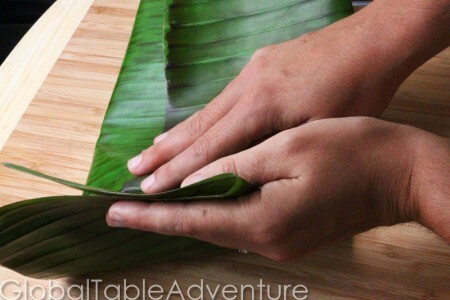 Trim off the tough side of the banana leaves. 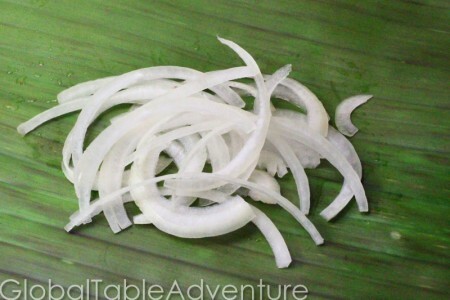 Run the leaf quickly over a flame to soften it and make it more pliable. When it changes from dull to shiny, it is soft enough. 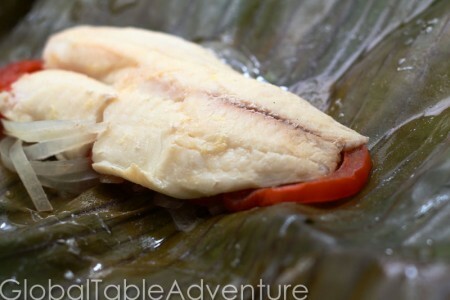 Assemble the liboke by placing the fish on the leaves/foil. 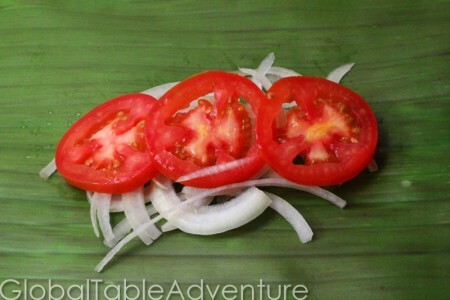 Place onions and tomato slices. 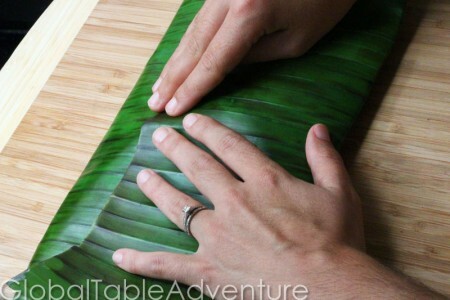 Fold leaf/foil up like a burrito and close it securely. 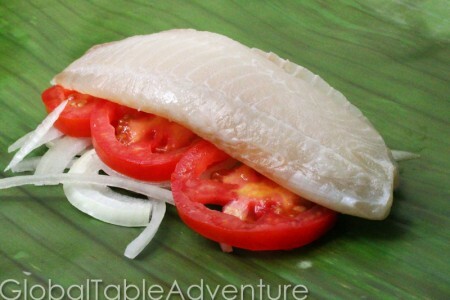 this looks delcious..recently i have gotten into cod..I wonder if that would be a good choice for this meal? I make a cod sandwich with just mayo and fish…on really good bread..oh joy!